On our last day in Prague, Vladimir the owner of Prague Foodies showed us around the beautiful city of Prague and introduced us to very traditional and delicious food from the Czech Republic. We really loved the FoodTour with Vladimir, we had so much fun, enjoyed amazing food and we also learned a lot! Vladimir is a really nice guy, very fun and entertaining! 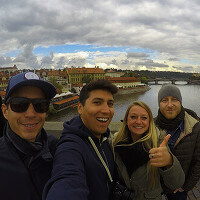 He picked us up at our Hotel (read more about the andel’s by Vienna House Prague) and showed us great things in Prague. He started his own business – Prague Foodies – about 2 years ago and loves it to show tourists his hometown! Our first stop was a traditional restaurant, where Vladimir ordered Svickova for Jeremy and me and Duck for David and himself! I have had Svickova on the day we arrived, and I could eat that every single day! This is for sure one of my favourite dishes in the world now! 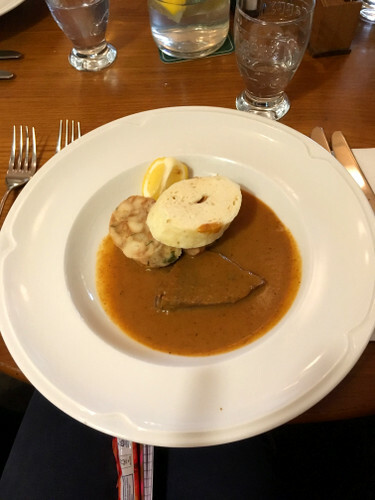 It is beef with dumplings in an amazing sauce! So yummy. 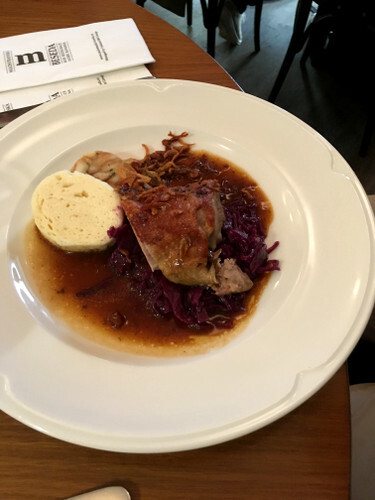 And the duck was excellent as well, really really great and tasty food! Our next stop was a really good deli. We tried 4 different things there. The first was pastrami with homemade mayonaise and bread. This was so yummy that we decided to bring 600 grams home! We like it so much, it has a very special taste and goes perfect with bread or sandwich buns. 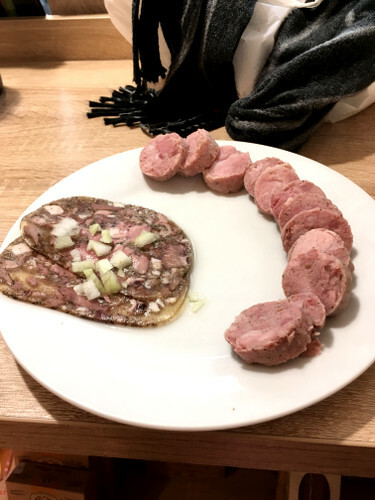 The secound meat we tried was a warm sausage called Italian and aspic with vinegar and onions. The last meat we tried was a deer sausage, which we were thinking about bringing back home for my dad! But the pastrami was our favourite so we got a lot of it to enjoy it at home as well! Our last stop was a pastry shop, because I love desserts. 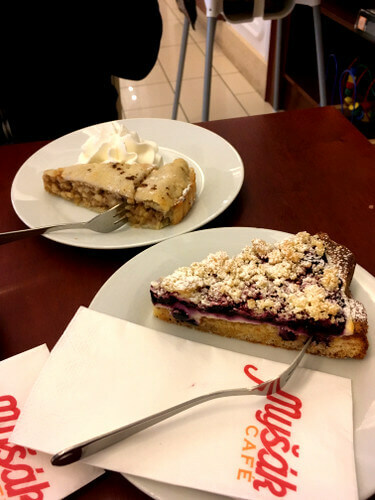 Vladimir showed us the traditional czech cakes and let us pick what we liked to try. 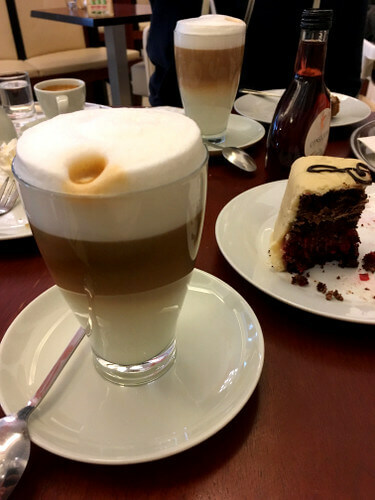 So Jeremy got a traditional blueberry cake, David picked an apple pie, which looked kind of a strudel and was served warm and I got the Sacher with marchpane. I think the best one was Davids choice, but all the cakes were very tasty! And the coffee was really really great! The best way to see the city and eat traditional dishes is to do a tour with a local! 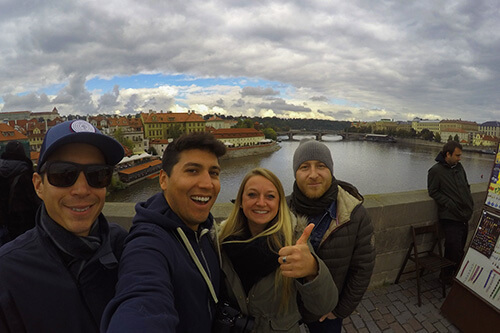 We recommend you to meet Vladimir and we promise he will make your Prague trip special! He also helped me to find a good store to buy some beads for my handmade jewelry! THANK YOU VLADIMIR FOR THE GREAT TIME AND THE DELICIOUS FOOD!